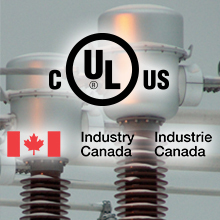 Several Medium Voltage transformers were certifi ed last year by UL, reference approval in electrical equipment in the United States, which assesses both technical aspects such as safety of the appliances, and by MC, the certifi cate granted by Industry Canada required for all billing apparatus in that country. UL, which validates various aspects of the equipment, such as their fl ammability or durability, has approved several Arteche voltage and current transformers, for both indoor and outdoor use. Measurement Canada/Measures Canada, on its part, has certifi ed both voltage and current instrument and combined transformers for outdoor use.